Thank you, David Welch, for this stunning and very current (shot on November 8, 2015) drone footage of the Gay Head Lighthouse. Click the full-screen icon (see below) and watch in HD for the full, gorgeous effect. Toward the end, you’ll see the early stages of the new landscaping we will all enjoy next spring when the lighthouse reopens to the public. The Gay Head Light will close to the public on Monday until next spring, marking the end of its first season in a new location and the beginning of a multi-year restoration project, focusing on the historic brick-and-masonry tower and its immediate surroundings. Between May 27 and May 30 this year, the lighthouse was moved 129 feet away from the eroding cliffs, buying at least 150 years before erosion may require another move inland. A stone wall similar to one that existed just east of the lighthouse in the 1880s now marks the boundary between town and Coast Guard properties, and a circular stone- and-brick bench marking the building’s original footprint is under construction. The area around the lighthouse has been covered in sod, with a split-rail fence along the cliff edge, and other landscaping features taking shape. 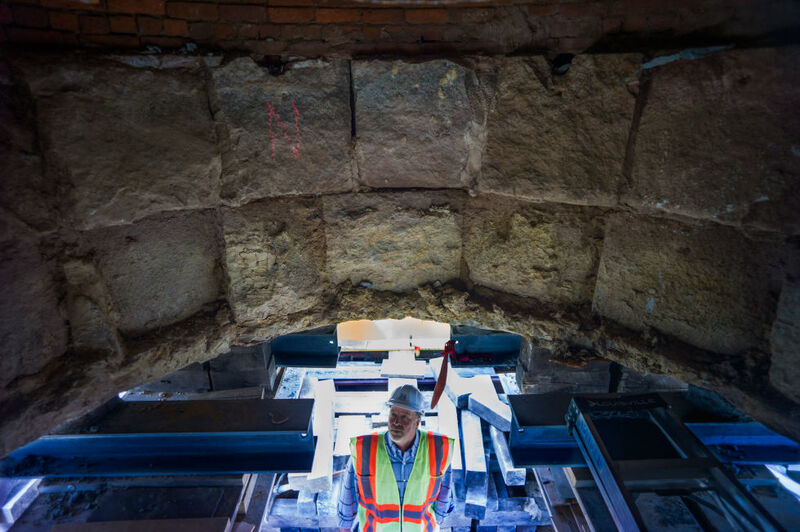 The 400-ton tower survived the move without a single crack, but decades of wind and rain have eroded some of its cast-iron features, including a railing surrounding the upper gallery, and an exterior ladder leading to the light room. During a severe storm in the 1800s, a portion of the brick wall below the light room shifted and cracked, and was replaced with a new brick wall that has also deteriorated over the years. Hurricane Joaquin stayed away, but runners in today’s Gay Head 10K faced stiff winds as they raced the scenic up-island course. Overall winners were Rene Da Silva of Vineyard Haven and Alex Testa of Somerville. You can see full results, overall and by age group, by clicking here. Check back here for photos. Thanks to all who participated, including our fabulous volunteers, police, EMS and town employees, for making this year’s race a huge success! Capt. John Kondratowicz, Commander of the U.S. Coast Guard Southeast Sector, toured the relocated Gay Head Lighthouse with Richard Skidmore, lighthouse keeper, and Len Butler, relocation committee head. Impressed with the light’s history, Capt. Kondratowicz commended the committee and the Town of Aquinnah for their successful move of the structure. He also expressed great interest in the artifacts discovered during excavation and incorporated into the new location. and tour of the relocated Light. “This is a terrific start to a long-lasting partnership between the Town and the USCG,” he said.